Mash 2 of the bananas with a fork in a small bowl so they still have a bit of texture. With an electric mixer fitted with a wire whisk, whip the remaining bananas and sugar together for a good 3 minutes; you want a light and fluffy banana cream. Add the melted butter, eggs, and vanilla; beat well and scrape down the sides of the bowl. Mix in the dry ingredients just until incorporated; no need to overly blend. Fold in the nuts and the mashed bananas with a rubber spatula. Pour the batter into the prepared loaf pan. Give the pan a good rap on the counter to get any air bubbles out. Bake for about 1 hour and 15 minutes, until golden brown and a toothpick inserted into the center of the loaf comes out clean. 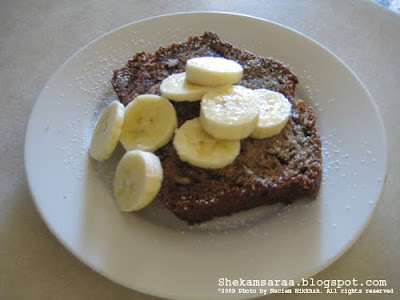 Don't get nervous if the banana bread develops a crack down the center of the loaf; that's no mistake, it's typical. Rotate the pan periodically to ensure even browning.